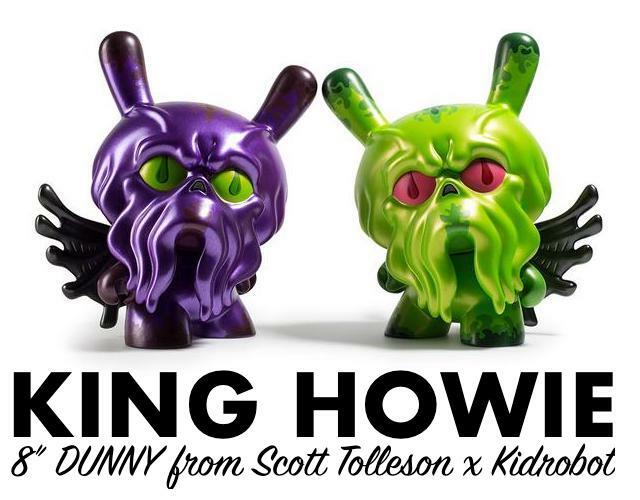 Unleashed into the toy world just, was Scott Tolleson’s KING HOWIE 8-inch tall Dunny from Kidrobot. Priced at US$80 per, this beast from the depths of awesomeness is available in to editions: the 500pcs run GREEN retailer edition, and the Kidrobot Exclusive PURPLE - limited to 200pcs worldwide. Of course I want BOTH of them, innit? #wishfulthinkingIknow And EVERYONE needs some cthulhu in their life, innit? Heh. "The sailors would often talk about what they feared most about heading out into the open sea. It was not the sharks or serpents. It was not falling into the dark abyss below. But rather the Odd One that lived there. Thy all feared the King. The ancient King of the Sea. King Howie." FYI: “Howie” the cthulhu character first appeared in Tolleson’s “The Odd Ones” 3-inch tall series (also from Kidrobot) and has also been released as a exclusive color way in NYCC2016 too. Will we be getting an exclusive colorway this year for New York Comic Con 2017 too?